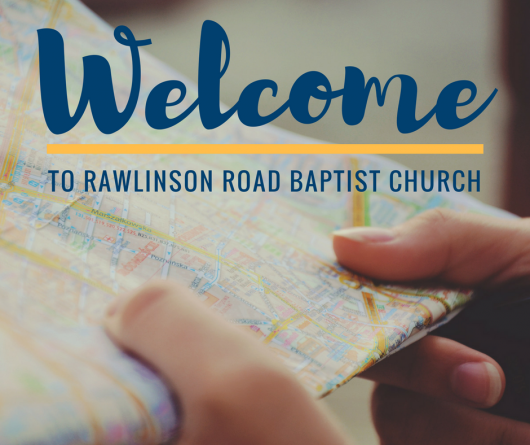 Welcome to Rawlinson Road Baptist Church! We can’t wait to meet you. On this page you will find some information that may make your first visit to RRBC a little easier. Please email or call us if you have any questions. We are happy to help. We are located at 1024 Rawlinson Road in Rock Hill. We have parking on all sides of the church; however we encourage guests to park in either of the front lots. Please enter through the front doors of the church. Our greeters will meet you at the front door to welcome you to Rawlinson Road Baptist Church. Sunday School begins at 9:00 AM and the Worship Service begins at 10:00 AM. We recommend arriving a few minutes early if you have children in order to get them to the correct ministry area. During the 9:00 AM Sunday School hour we have classes for every age group birth through high school. Our greeters will be able to direct you to the correct classroom for each child. After Sunday School, children birth through kindergarten will stay with their Sunday School teacher through the 10:00 AM Worship Service in our extended childcare session. Children 1st – 3rd grade will be escorted to the sanctuary by their Sunday School teacher, and will sit as a group until they are dismissed by an announcement after the welcome and fellowship. This is also the time for children 1st – 3rd grade who are sitting with their parents to leave with the children’s group to go to Children’s Church. Children 4th grade and up should be picked up by their parents/guardians after Sunday School to join the adults in the 10:00 AM Worship Service in the sanctuary. We fully believe in “come as you are”. Many people wear casual slacks, button down shirts, dresses, skirts, etc. Some wear suits and some wear jeans. Wear whatever makes you feel comfortable. What is your church culture like? Great question! We are a group of people loving people. We strive to build relationships and be a church family that can do life together.